This post is in All we want is life beyond the thunderdome, Dolt 45, immigration, Media, Open Thread, Trump Crime Cartel and has 148 Comments. Roger Stone Pursues the Path to Martyr-dumb! by Adam L Silvermanat4:02 pm on February 18, 2019 . It has 100 Comments. Stone adds: "One of the people who works for me posted it but I disagree that it violates any aspect of the judges order. Because it has been misinterpreted I ordered it taken down In though everything contained was factual." To be serious here for a moment, a simple google image search for Judge Amy Berman Jackson, returns dozens of images of her. To find one with a cross hairs image or logo near her head meant that whomever went looking for an image for Stone’s post had to specifically either be looking for an image like that or trying to create one. Which is not surprising given that Stone has a long history of positing material with anti-Semitic themes or borrowing them from people and our sites that do. Here’s just one example. Also, why does it look like Rudy has a squirrel crawling around in his flight suit? Ewww!!! In regard to Roger Stone, as they say in the south: that boy ain’t right! This will definitely not get Judge Jackson removed from the case, but it is likely to get Federal law enforcement to overreact. Especially as some of the people who follow the conspiracy theories that Stone promotes tend to take them to heart and then take violent action as a result of them. I don’t think Roger Stone’s image is anything close to a true threat. However, feds are known to massively overreact to this sort of thing. This post is in All Too Normal, America, Crazification Factor, Domestic Affairs, Election 2016, Election 2020, Foreign Affairs, Media, Open Thread, Politics, Popular Culture, Post-racial America, Silverman on Security and has 100 Comments. https://www.balloon-juice.com/wp-content/uploads/2015/11/balloon_juice_header_logo_grey.jpg 0 0 Adam L Silverman https://www.balloon-juice.com/wp-content/uploads/2015/11/balloon_juice_header_logo_grey.jpg Adam L Silverman2019-02-18 16:02:122019-02-18 16:02:42Roger Stone Pursues the Path to Martyr-dumb! by Adam L Silvermanat1:51 pm on February 4, 2019 . It has 250 Comments. Even as Governor Northam huddles with his cabinet as an attempt to maintain his governorship of Virginian, the same fine folks that thought Breitbart was too liberal have decided to direct fire against Lieutenant Governor Justin Fairfax. RICHMOND, Va. — As Virginia Governor Ralph Northam faces increasing pressure to resign over a racist photograph from his 1984 medical school yearbook, the man who would take his place — Lt. 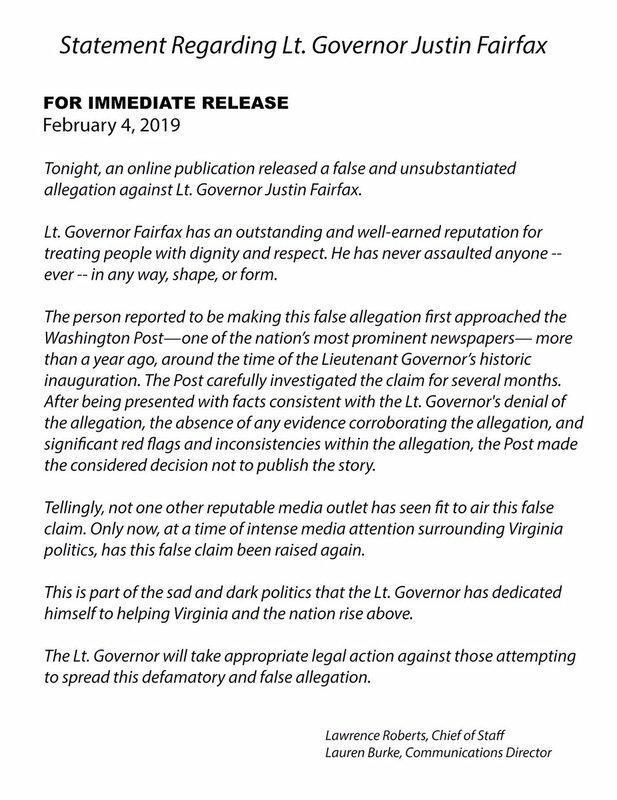 Governor Justin Fairfax — is responding to accusations of his own. The allegation involves an unsubstantiated claim of sexual assault against Fairfax during the Democratic National Convention in 2004. The claim was posted Sunday night on the same website that first published the racist photo from Gov. Northam’s yearbook. A post on the conservative website Big League Politics went live just as the Super Bowl ended late Sunday. Allies of the likely heir apparent to embattled Gov. Northam called the development a clear smear tactic, as Fairfax’s profile rises. “This is part of the sad and dark politics that the Lt. Governor has dedicated himself to helping Virginia and the nation rise above,” the overnight statement read. WUSA9 is refraining from publishing further details of the claim, as key elements have not been able to be verified. Broad outlines of the claim are only being published after Fairfax’s office released an official statement now in public view. The full details of the allegation are on Big League Politics. This allegation was previously investigated by both local Virginia news outlets and The Washington Post last year and they could not substantiate it. That doesn’t mean it isn’t true, or parts of it aren’t, but that the allegations couldn’t be corroborated and/or substantiated. Longtime Republican campaign strategist and strategic communication professional Rick Wilson thinks something here stinks in regards to how the allegations against Lieutenant Governor Fairfax came to light just after a “concerned citizen” discovered Governor Northam’s yearbook page. I'm beginning to suspect the "concerned citizen" in the Northam case is the Ginger Menace, Charles Johnson. Doesn't change what Northam did, just starting to have a spider-sense about it. If this is an attempt to place the Virginia governorship in Republican hands, sort of a coup by scandal, it won’t work unless there’s a scandalous story involving Virginia Attorney General Herring teed up and ready to be deployed because the only Republican in the line of succession is the Speaker of the Virginia House of Delegates is Republican William J. Howell. What is unclear right now is what, in the larger political sense, specifically of partisan political warfare, is actually going on. If this is a coordinated attempt to remove the Democratic leadership of Virginia’s executive branch through selected news reports of opposition research that was either overlooked or never previously released because it couldn’t be verified, then expect Big League Politics or some other similar outlet to drop a story on Virginia Attorney General Herring in the next few days, especially if other news outlets give the allegations against Lieutenant Governor Fairfax serious coverage and the pressure builds on him to resign as well. This much coincidence, long buried inappropriate behavior by Virginia’s Democratic governor and lieutenant governor that one would have expected to have been put forward as oppo research much earlier in their political careers, takes a lot of work. That it doesn’t seem to really be a coincidence doesn’t excuse Governor Northam’s admission he dressed in blackface to go to a theme party as Michael Jackson, even as he disputes that he is either the person in blackface or the person in the Klan costume pictured on his yearbook page. Nor would it excuse Lieutenant Governor Fairfax if the allegations that have surfaced regarding sexual assault are substantiated. That it would all surface right now seems much too convenient. Once is chance, twice is coincidence, the third time is enemy action. Lieutenant Governor Fairfax is giving a press conference right now where he is both addressing the issues around Governor Northam and the resurfaced allegations against himself. I can’t find a live stream. If I do, I’ll update the post. This post is in America, Domestic Affairs, Media, Not Normal, Open Thread, Politics, Popular Culture, Post-racial America and has 250 Comments. by Cheryl Roferat5:24 pm on December 30, 2018 . It has 165 Comments. This post is in Dolt 45, Election 2016, Media, Our Failed Media Experiment, Trump Crime Cartel, Trump-Russia and has 165 Comments.